Step three of getting infinite combo’d: Bargaining. At AnimEvo, a side tournament was held for one of the most hype games ever made, Hokuto no Ken. Based on the Fist Of The North Star anime, this game has everything from one-hit instant kill moves to dribbling, and of course, infinite combos. 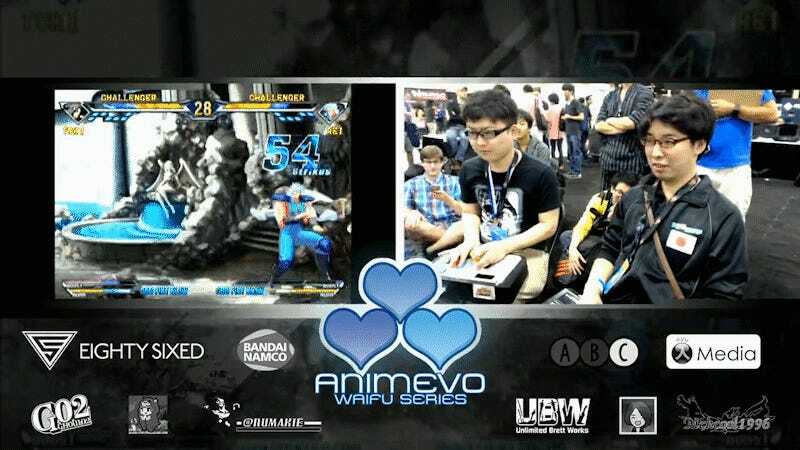 In the grand finals, Setsuo knocked Heartia, his competitor from the loser’s side of the bracket, into an infinite combo. The round was over, so long as Setsuo didn’t drop the sequence, and he wasn’t going to. So Heartia decided to break some new ground and bargain with his opponent. Both competitors laughed it off, and Setsuo finished out the round and went on to win the tournament. Infinite combos are common enough in high-level Hokuto no Ken that many competitors found their own ways of coping. Heartia used the free time earlier in the tournament to take a few selfies with nearby players. Heart player Taitsu, meanwhile, requested his fidget spinner as he watched his virtual avatar get dribbled like a basketball. Seriously, he had a fidget spinner on standby. That’s how prepped these guys are for the inevitable juggle.